Big things were expected of USC in Steve Sarkisian's first year as head coach with the program. And, a flaming hot start seemed to prove that the Trojans were "back". Though, USC tailed off after what appeared to be a huge victory against Stanford and couldn't close games, evidenced by a hail mary loss to Arizona State. A 9-4 mark wasn't bad by any means, but Sarkisian, who was a former offensive coordinator at USC before returning after a head coaching stint at Washington, knows USC fans expect more. The Trojans were perhaps the most dominant program in college football in the 2000's, but they have fallen back due to NCAA sanctions, coaching problems and more contributing to a rather pedestrian (by USC means) mark of 44-21 over the past five years. Though, Sarkisian landed a top notch recruiting class on top of some truly amazing talent left too him by Lane Kiffin. That talent could combine with Sarkisian's aggressive offensive scheme, and wreak havoc across the Pac-12. USC fans should once more get excited about the program entering 2015, but shouldn't feel the typical disappointment they have felt the last few seasons. This team is too talented not too make some serious noise, and vie for a Playoff berth. 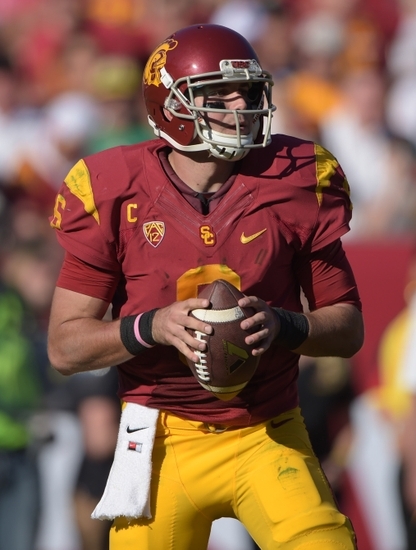 Backfield: There might not have been a quieter Heisman-caliber season than Cody Kessler's 2014-2015 campaign in college football a year ago. Kessler threw for 3,826 yards and 39 touchdowns with just five interceptions, and was the arm beyond the Trojans' explosive offensive attack. Kessler has the huge arm to make all types of throws and has grown and matured to the fact that he will read defenses much better. He isn't a wonderful athlete, but he can make plays with his legs when needed and possesses just the ability to create plays out of nothing. With USC very dangerous and the Trojans once more employing the spread attack that Steve Sarkisian loves, Kessler should put up crazy numbers once again. Though, he will be without one of his major helpers, running back Javarious Allen, who left for the NFL. "Buck" put together a tremendous season himself, with 1,489 yards and 11 touchdowns. He combined decent size and durability with game-changing speed and he certainly will not be easily replaced. There are replacements in the backfield, because this is USC, and blue chip recruits are also waiting in the wings. Junior Justin Davis could explode for huge numbers this season. Davis ran for 595 yards and four touchdowns a year ago as Allen's backup, proving to have incredible versatility and playmaking ability. He isn't the most explosive player on the field but he isn't afraid of contact and uses his frame to his advantage. Senior Tre Madden should also be in for quite a few carries himself. Expected by many to be a contributor to the Trojans' offense a year ago, Madden struggled through turf toe and other ailments that caused him not to see a snap of game action. The USC Trojans certainly missed him, as he could have provided even more punch between the tackles and a proven commodity in short yardage. Madden and Davis will both be used quite a bit, that is if they stay healthy. Davis hasn't had much issues with injuries, but Madden has missed two of the past three years with a multitude of injuries. Steve Sarkisian is clearly a great offensive mind and him and OC Clay Helton will be smart with how they use the running backs. Even with two veterans clearly ahead of him on the roster, Trojan fans might see decent doses of freshman Ronald Jones II. Jones has the talent to be the next big thing in the USC backfield, rated widely as a four-star recruit out of Texas. He is also rated as among the best incoming backs in the land, and his vision and carrying are off the charts. At fullback, USC has senior Soma Vainuku back for his final year with the team. A longtime staple in the Trojan backfield, Vainuku is a proven run blocker who has always been a nice little bright spot when he does get the ball (7 rushes for 40 yards and a score in 2014-2015). Receivers: The Trojans have never struggled to put out studs at the wide receiver position (they don't struggle to produce stars at other spots either), but their most recent, Nelson Agholor, left for the pro game. Agholor was as explosive and exciting they come, and he could work wonders in Chip Kelly's offense in Philadelphia. While, Sarkisian and USC will miss Agholor, there is widespread confidence that sophomore JuJu Smith can take over as the top pass-catcher for the offense. In his first year in a Trojan uniform, Smith showed crazy potential, and it wasn't just flashes here and there. He had 54 receptions for 724 yards and five touchdowns and he was a player that was always a threat to break one deep every time he touched the ball. While Smith should take over as the No. 1 target, fellow sophomore Adoree' Jackson may be the most talked about in the unit this year. More known as a defensive back, USC has given Jackson opportunities at receiver and could have him play both ways this year. Jackson had 10 catches, with three of them going for touchdowns. He is an electrifying type player who seems to be good at everything he does. Drops could be a problem along with route running because receiver isn't his most natural spot, but athletes like him don't come around often, even at a place like 'SC. The big play abilities of both Smith and Jackson will open up things for returnees like Darreus Rogers and Steven Mitchell. The departures of Agholor and George Farmer mean that Rogers will be the most experienced receiver in the Trojans' receiving corps. Reports were great from the spring, as Rogers was "catching everything in sight". He might be the exciting and youthful players that Smith and Jackson are, but Rogers knows how to get the job done. Sophomore Steven Mitchell didn't get a ton of action last year, but he did step up when needed. Without Agholor and Farmer, he will see a vastly increased role. Despite being undersized, Mitchell uses his reliable hands and elusiveness to make plays. JUCO transfers Isaac Whitney and De'Quan Hampton are going to make noise in Los Angeles. Both are rated as four-star transfers, and are two of the Top 5 junior college transfers at the position. Hampton is perhaps the most agile and quick, but Whitney's combination of size and speed make him a sure bet to see plenty of action in his first season with the Trojans. Tight end will be an interesting position; Bryce Dixon played in 12 games a season ago but lingering issues would lead to a departure from the program. Junior Jalen Cope-Fitzpatrick is a stud, but he missed all of last season, after being academically ineligible and he will most likely be pretty rusty. Sophomore Connor Spears is also going to be in the rotation, along with grad transfer Taylor McNamara. A solid blocker and decent weapon in the red zone, McNamara arrives from Oklahoma and will definitely see snaps. Offensive Line: Offensive lines aren't the prettiest nor flashiest part of college football, but dominant O-Lines can put a team in prime position to win games perhaps more than anything else. USC's offensive line will be pivotal to their success this season, as five starters return, with a number of them likely to be All-American or All-Conference candidates. Senior Max Tuerk is the star and unquestioned leader of the unit. Tuerk earned himself All-Pac-12 honors for his fantastic play a year ago and he is a legit All-American possibility entering his final year in Los Angeles. Tuerk is a gritty and hard-working linemen in the heart of the unit. He is blessed with impressive size and footwork, and he provides major push between the tackles. He will be helped on the inside by two rapidly improving sophomores, Damien Mama and Viane Talamaivao. Both big recruits for the Trojans a year ago, the pair saw significant action in their true freshman seasons. Talamaivao especially, performed incredibly well. Although he did make mistakes, which were definitely understandable, he didn't seem intimidated by the physical and speedy play of major FBS football. Both Mama and Talamaivao will help guide the way in opening up huge lanes for Davis and Madden to work through on the ground attack. Another second year stud, Toa Lobendahn is slated to start at left tackle. The versatile Lobendahn can play either guard or tackle, and is dominant at either. He isn't the biggest tackle there is, but he is athletic with great lateral quickness, to make key blocks side to side. Junior Chad Wheeler returns, but is likely to play a backup role to Lobendahn at tackle this season. Don't forget about right tackle either; junior Zach Banner is an established monster at the position. Yet another blue chip recruit, Banner's size and talent were never a question, it was merely a matter of when he would turn into a star. At 6'9", 350 pounds, Banner is absolutely gigantic,even among some of the bulkier linemen in the conference. That size and upside has always been a major appeal to NFL teams, and he is still improving. Depth is definitely a problem for the unit though; the NCAA sanctions following the Reggie Bush debacle have been a problem for a few years now, as the loss of scholarships has hurt USC everywhere in the depth department. Junior Jordan Simmons is an experienced guard and Wheeler could see snaps, but beyond that there is mainly only true freshman who could see action, so the Trojans certainly will be hoping the injury bug doesn't bite. Perhaps Georgia product Chuma Edoga could see action in his first year with the Trojans. The five-star tackle has all the physical tools to be a wonderful tackle for USC. Center Cole Smith, who stays in the state of California, and more, will play vital roles down the line for USC, but are depth guys at best this season. Defensive Line: For the whole 2014-2015 season, NFL scouts flocked to USC games and film for any glimpses of Leonard Williams. The monster defensive linemen had all the tools; NFL size, speed, athleticism and an incredibly high motor. And, he was quite the productive player in his time with the Trojans, picking up 80 tackles, seven sacks and 9.5 tackles for loss last year alone. But, Williams made the expected jump to the pros, and will now hope to a productive member of the New York Jets. Second year defensive coordinator Justin Wilcox is a great mind though, and he will think of creative blitzes and schemes to make sure this defensive line and front seven doesn't miss a beat. Wilcox and USC have a very capable group at their disposal; senior Antwaun Woods is a proven run stuffer, while there are multiple playmakers at defensive end. Woods had 37 tackles a year ago, and the big, brutish tackle makes a living clogging up lanes and bringing backs to the ground. He will be supported on the interior by Claude Pelon, another senior. Sure, Pelon is a far cry from Williams, but he is another high energy guy who just knows how to get the job done. Sophomore Kenny Bigelow has loads of potential, and the Trojans will work to get him a decent dose of snaps at defensive tackle as well. The defensive end spot is going to be filled with a solid crop of seniors, with Delvon Simmons likely to emerge as the starter. Simmons isn't the flashiest pass rusher ever, but he is another experienced, hard-working and productive player. He had 44 tackles in 2014-2015 and plays with great discipline and smarts on the perimeter. Senior Cody Temple is also going to compete for plenty of snaps. Built more like an interior linemen than end (considering he is 6'2", 310 pounds), Temple is surprisingly quick and athletic. Temple managed two sacks last season despite not much work, and he should raise that number considerably this year. This unit isn't quite as inexperienced or lacking in the depth department as others, but true freshman could still fight for snaps. Not surprisingly, there are a number of future NFL players joining the defensive line from the Class of 2015. Rasheem Green earned a five-star from 247 Sports and much more, and California prospect has all the tools. He is blessed with excellent size and a high motor, and he will fight to play some snaps at tackle. Less heralded Jacob Daniel is also coming into the fold, and the Fresno pickup could see some action as well. Overall, the defensive line is nearly completely different from any other unit on the USC roster. It has seniors likely to start across the board, decent amounts of depth and not the big name-NFL prospects that other units may have. But, it should still be very good, and make up for the big loss of Leonard Williams. Linebackers: For anyone who is quick to discredit the Lane Kiffin era at USC, there is one clear thing he did that definitely helped USC down the road: land prized recruit Su'a Cravens. Now a junior, Cravens will compete with Scooby Wright of Arizona for the claim of perhaps not just the best linebacker in the Pac-12, but in the nation as a whole. Originally joining USC as a safety, Cravens versatility and great mind are amazing. 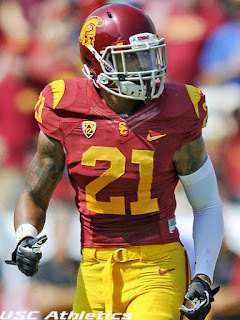 Cravens' size and the need for help at linebacker pushed the Trojans to use them there, and they shouldn't look back. He went absolutely off last season, picking up 68 tackles, 17 tackles for loss, five sacks and three interceptions, one which he returned for six. Cravens' size and great instincts allow him to make the correct plays as a run defender, while his experience at defensive back allows him to make the right reads there and pick of passes. Having a player like him that can literally step up and do everything you need is so huge, especially when you face some of the offenses that USC faces. Cravens has support around him, namely senior Anthony Sarao. Sarao is back to man the middle linebacker position, and the veteran has proven to be a fantastic tackler, with 74 last year. Sarao also is a strong coverage 'backer, with two interceptions last season as well. Fellow senior Lamar Dawson is finally back, and will play a very key role for the Trojans. Once hyped as "the next great thing" at linebacker for USC, Dawson's career has been mostly overshadowed by injuries. In fact, the last snap Dawson played of competitive football was been in late 2013, before he was lost for over a year with knee problems. Still, Dawson has 137 career tackles, and is a proven playmaker at the position. You still have to worry about his knee and his health, but he is apparently "100 percent". The outside linebacker spot opposite of Cravens is going to be an interesting little competition. Juniors Jabari Ruffin and Scott Felix are competing for the starting gig, both with their are own individual strengths. Ruffin is an incredibly quick and physical linebacker, while Felix is skilled with finesse moves and as a pass rusher off the edge. Ruffin is another player coming off troubles with injuries, as he has suffered long and hard with knee problems. Though, he is a high potential guy who has proven he can play with the best of them when healthy. Secondary: USC's pass defense had some major ups-and-downs last season, particularly when they go into conference play, but there is no denying the talent in the unit. It all starts with Adoree' Jackson; sure the exciting sophomore is going to see at least some action at receiver, but his strength lies at cornerback. Jackson had 49 tackles last year, along with four tackles for loss playing at corner a season ago, and you could still argue he was learning the ropes. He uses his incredible speed and athleticism to hang with some of the conference's most explosive receivers. He's not exactly a ball hawking playmaker who picks off a ton of passes but he is as good at man coverage as you will find at his age. The big question for Jackson will be about durability; he will see action on special teams as well along with receiver and defensive back. Even though the dude is unbelievably talented he can't do everything for USC, and they will have to be smart with how and when they use him. Jackson will form a great combo with senior corner Kevon Seymour. Seymour isn't exactly the big flashy name that some of the other USC Trojans are, but the veteran is a proven contributor who is physical and wonderful in coverage. He had 13 pass deflections last year, while also recording 49 tackles showing that he could step up in run support, and also make great wrap up tackles in the open field, definitely an important gift in today's college football, filled to the brim with spread offenses and speed. While those two will start, true freshman Iman Marshall is going to see plenty of action, somewhere in the secondary. Marshall is ranked by ESPN, 247 Sports and plenty more as the top cornerback in the 2015 Class, and those talents won't go too waste. The Long Beach prospect already has a good, solid build and great play recognition. If he doesn't play at corner, Wilcox would be happy to lend him snaps at either safety slot. Those two safety positions will be interesting, with some young, but talented players likely to start there. While young, both of those safeties have proven they can play wonderfully. Leon McQuay III is a hard-hitting junior who fills in at free safety. His 36 tackles, two interceptions and four pass deflections in 2014-2015 only show a fraction of what he can do. Sophomore John Plattenburg is not quite the hard hitter or incredible athlete but he is quick and has a great feel for the game. He knows what needs to be done, and the strong safety gets there and completes it. He should also improve on his 32 tackles from a season ago. Youthful cornerbacks Jonathan Lockett and Lamont Simmons have a lot of work to do, but the talent is there for them to be very good. Simmons, especially, as the redshirt freshman possesses the size and great range that many shutdown corners have. Special Teams: Kicker Andre Heidari was a steady force at the position, who was a valuable asset late in games. His departure plunges the position into a question mark, but junior Alex Wood has emerged as the favorite. Punter Kris Albarado enters his senior year as an All-Conference candidate, and Adoree' Jackson is going to run wild in the return game. Last year was supposed to be the year of the Trojan resurgence. Though, there were just too many moving pieces for that team to fully contend. This season it almost seems certain that USC will be back to doing what they used to do; putting up a lot of points, winning a lot of huge games and establishing themselves as a national power. Sure, the schedule is no breeze, and sure there are some losses that are noticeable (Allen, Agholor and Williams will be missed). But, the talent on this roster is pretty insane, even by USC standards. Kessler is a legit Heisman candidate, the backfield is stocked with fresh legs, the receivers are scary, the O-Line is powerful and Cravens and Jackson head what should be a great defense. With the exception of injuries, this USC team is a sure fire bet to win at least 10 games, and they should have a much higher ceiling than that. Tough road meetings with Arizona State, Notre Dame and Oregon will be huge tests, but Sarkisian is on a mission to prove that he can be the one that leads USC back to the glory days. In this case, a Playoff appearance would certainly prove that.